In January 2011, our dreams came true and we purchased a small hobby farm in Central NJ. Our goal has always been to focus on livestock conservancy and sustainable living. We are members of the American Livestock Breeds Conservancy, helping to ensure the future of agriculture through the genetic conservation and promotion of endangered breeds of livestock and poultry. We have been active in Greyhound rescue for many, many years, and in a way it was the hounds that shaped our direction in life. It was only natural to name the homestead after the gentle creatures that share our life. 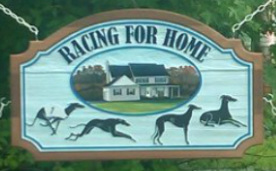 For more information on greyhounds, see our greyhound page through the link above. 2019 Miniature Silky Goat kids have arrived and are spoken for at this time. We will update the new arrivals page with any availability if retained kids are released for sale. 2020 breeding plans are in the works, with two new herd sires and a new junior doe joining the line up, exciting things will be coming soon! Magpie ducklings and hatching eggs are sold out for the 2019 season. The 2020 waitlist is building now, be sure to let us know if you want to be added to the list. NOTICE: Due to continued low hatch rates for Sebastopol goslings, we will no longer be offering shipping. Goslings can still be reserved for local pick up in small quantities. 2019 season is sold out in full, the waitlist for 2020 goslings is filling quickly.